After spending 3 nights in Salzburg, it was time to move on to our next destination...the postcard-perfect town of Hallstatt. Considering that Hallstatt is a really small town and we could walk from one end of the town to the other within an hour, we decided to spend only half a day sightseeing here before continuing our journey to Vienna. Glad we made this decision coz it was so cold and 6 hours of sightseeing was more than enough for us, plus we were carrying our backpacks all around the town. Apparently, Hallstatt is called a 'cold hole' because the sun disappears sometime in November and doesn't return till March. Getting to Hallstatt from Salzburg by bus was easy. We took bus 150 at 8.15am from Salzburg Hbf to Bad Ischl. Bought our one-way ticket for €10.50/pax ($12) from the bus driver. This was a popular route so I wasn't surprised that the bus was quite full. Thanks to my kiasu skill, we were the first to board the bus...haha!! The bus route passes by the picturesque village of St. Gilgen so try to sit on left side of the bus to get great landscape views along the way. Arrived at the Bad Ischl train/bus station after 1.5 hours and waited for about 10 minutes to board the next bus 542 (and switched halfway to bus 543) towards Hallstatt Lahn. The journey from Bad Ischl to Hallstatt took about 45 min on both bus 542/543 and costs €5/pax ($5.50). It may sound complicated switching 3 different buses but it's actually real easy and the bus drivers know where you're going. Another good thing about taking a bus instead of a train is that we didn't need to take a ferry coz the bus stop is on the same side as Hallstatt town. We were welcomed by this amazing panoramic view as soon as we got off the bus..so pretty!! Our sightseeing route for Hallstatt was to walk from here to the other end where the church is (spot that one and only taller building). According to Wikipedia, "Hallstatt can be toured on foot in ten minutes"...told ya Hallstatt is small! Can't stop taking photos as we stroll along the water towards the town. Houses here are all built close to the cliffs on the mountains overlooking the lake, that's what makes this town so pretty. Last but not least, the classic village view point for the postcard-perfect photo. =) We were standing here for about 20 minutes and saw the sun barely for 10 minutes before it was blocked by the mountains again...no wonder it's called a cold-hole. I was so cold waiting for the ferry I really didn't bother how I look anymore...lol!! Boarded the ferry (€2.50/pax) to cross the lake to the train station. Goodbye Hallstatt!! There was really nothing on the other side of the lake apart from this small train station. Fortunately, there was a place to sit indoor while we waited for our train at 3.25pm. The train from Hallstatt to Wien-Meidling (Vienna) took 4 hours and costed €19/pax ($21). Snowy scenery along the way. Had to change trains twice along the way and finally made it to Wien Meidling station in Vienna at 7.30pm. We chose to stop at this station instead of the main train station in Vienna because it was closer to our hotel, where we stayed for the next 3 nights. 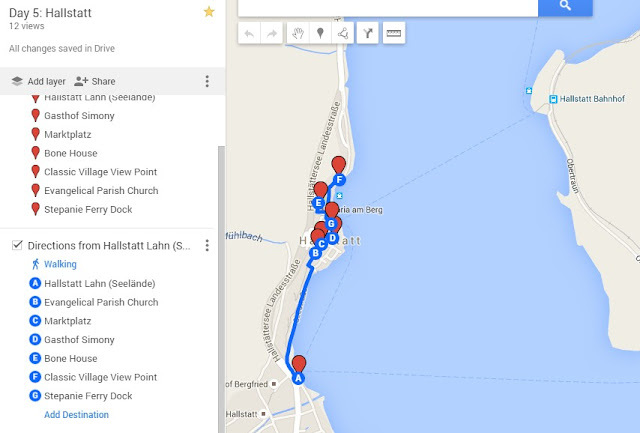 Our sightseeing map for Hallstatt.